Sorry if it was to much to explain the 3 letter acronym. No worries. Sensei says, " when you do your own research, grasshopper, your knowledge of subject grows". It is also true that corruption and poor business practices plauge non profit organizations. From what i have found 400 were captured in Texas/Louisiana. 43 of those were sent to be a breeding facility. Of those 43 only 14 were found to be pure red wolf. That is what they started the program with. Funny you can find all that information but lack the ability to google a simple acronym. You do realize NEP probably stands for different things. Google ECU see what comes up. Even so, why go through all the trouble of not explaining it to someone who asked? What caused the range to be adjusted? How does a study related to social insects relate to that map changing? 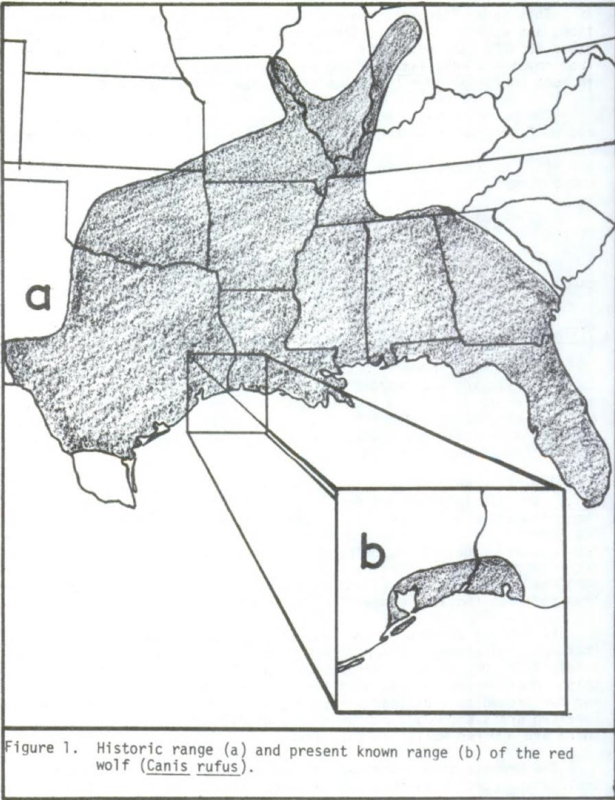 Wrong study, Nowak realized that in order to place the "new red wolves" in the ARNWR (Alligator River National Wildlife Refuge) the existing ESA (Endangered Species Act) rules required they be native to the area where they would be introduced. Hence the sudden appearance of red wolves on the newly adjusted map that showed NC as part of their range. You might find it of interest also that of those 14 (founders) which were declared as red wolves morphologically, they immediately started having hybrid offspring which were euthanized. The map was changed to include NC so that they could falsely claim it was being 'reintroduced'. And as to your earlier reference that "14 were found to be pure", that is incorrect because there was no DNA testing available at that time. Where do I find some of them troll sized spoons? When I researched the name that is literally all that came up. Nothing about wolves. Sorry for the misunderstanding. Lol, anyone who questions something is a troll. Just late to the convo and trying to catch up on the subject. anyone who questions something is a troll. Just trying to learn both sides of the argument. Sorry if that offends you. So what was the motive to introduce them into a supposedly non native area? Curious to know if you're a stakeholder. Well I grew up in eastern NC and now live in the Piedmont. Always grew up hearing about the red wolf program but never really knew all this drama associated with it. Fair enough. Good luck processing this. Just late to the convo and trying to catch up on the subject. ECU, your have to sharpen up or you're going to give the Pirates a bad name here. Seriously, if we seem to lack patience, it is because we've been lied to repeatedly by USFWS over the past 30 years. Patience is exhausted pretty much with the entire fiasco. Read the 175 pages as suggested if you really want to know, and then you won't be asking unlearned questions when the answers are already available. Was just trying to speed up the process for myself. Guess I'll have to do some reading. ECU, your have to sharpen up or you're going to give the Pirates a bad name here. Pretty sure I've already given them a bad name with some of the other lengthy debates I've been in on this forum. I tend to not share a lot of the prevailing views as many others on here when it comes to certain topics. Not real worried about it though.